On June 24, 2014, information and photos were posted on the Halfway House Tea Room, possibly the first parkway fast food restaurant in the United States. 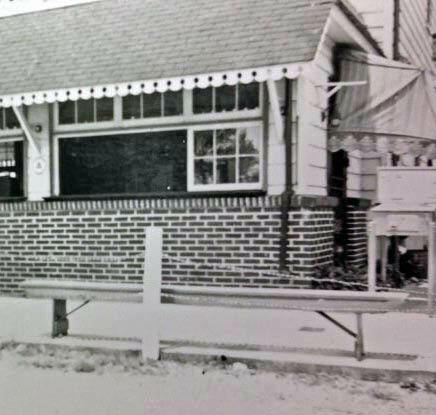 What was missing were photos of Ellen Foran's Tea Room when it was in operation in Central Park (Bethpage) from 1929 to 1938. Colleen Underwood, the great-granddaughter of Ellen Foran, has searched her family albums and discovered three relevant photos for VanderbiltCupRaces.com. 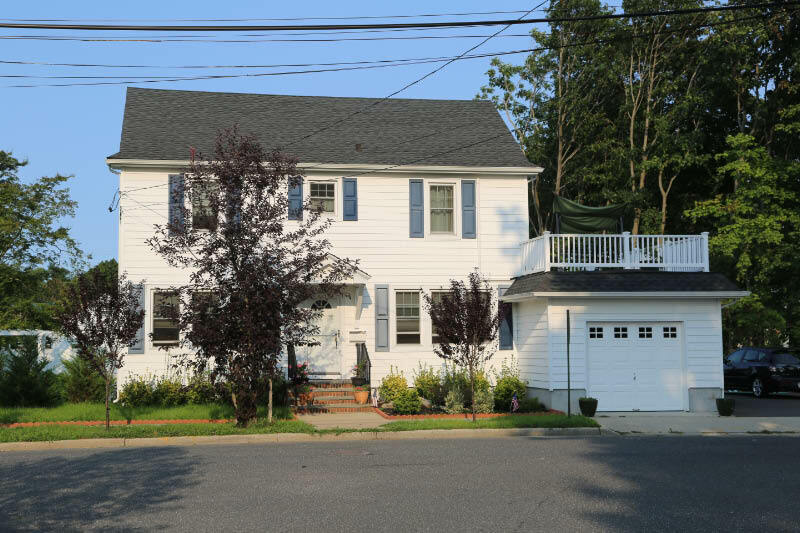 These photos and permission of the current owner to document the property provide another dramatic Then & Now. Thanks so much for contributing to preserving Motor Parkway history! Hope to see you tomorrow at the Motor Parkway East Walk/Ride. Al Velocci found this ad promoting Ellen V. Foran's "Halfway House Tea Room between the Bethpage Lodge and Massapequa Lodge on the Motor Parkway. Noted for "Frankfurters De Luxe."" Gas, oil and motorist supplies were also available at the location. 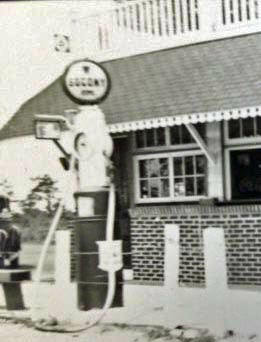 Colleen's first photo shows the restaurant's distinctive facade and a Socony gas pump. Gas was being sold for only 16 cents per gallon. 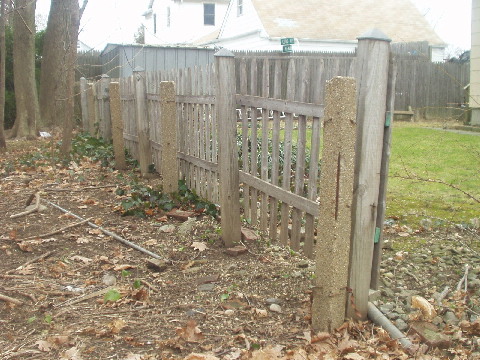 Look closely and you can see Motor Parkway concrete posts with three rows of wire. Colleen's second photo shows a Socony sign and a second pump. 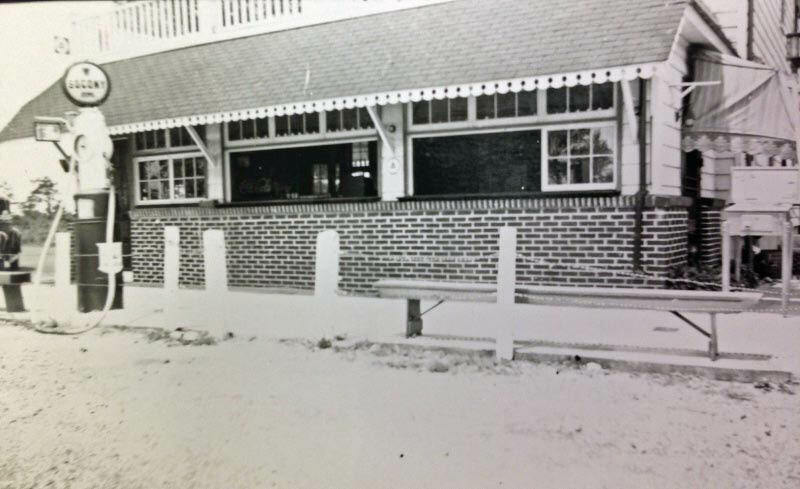 Note the distinctive patio on top of the restaurant and the brick facade. 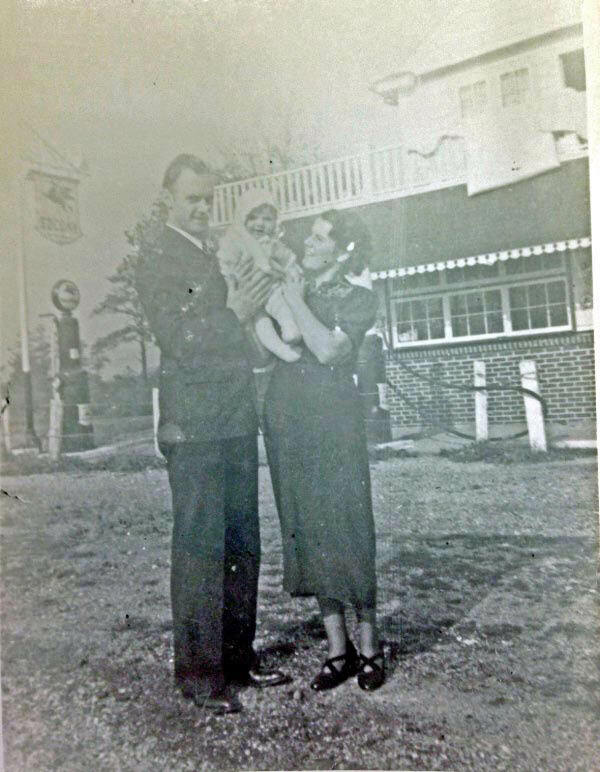 Pictured in the photo are Dorothy (Foran) McGunnigle (right), the daughter of Ellen Foran, her husband Raymond McGunnigle (left) and their son Raymond (middle). Baby Ray would become the uncle of Colleen Underwood. 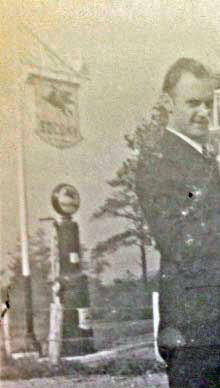 A close-up of the Socony sign and pump. 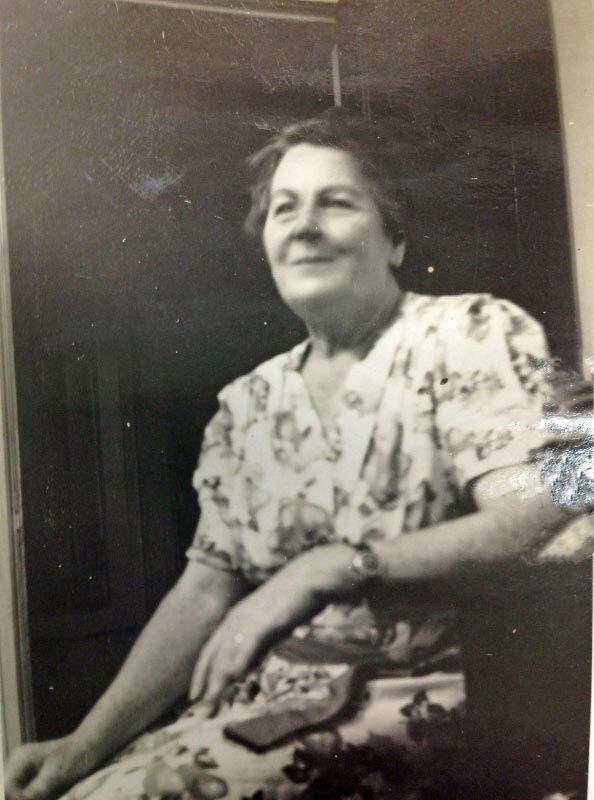 Ellen Foran, proprietor of the Halfway House Tea Room, as seen in 1943. 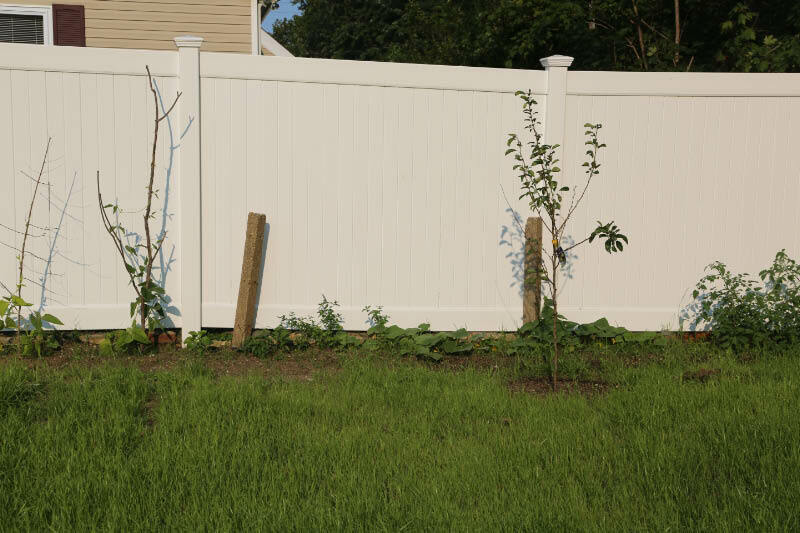 ...and these posts along the north/south perimeter. 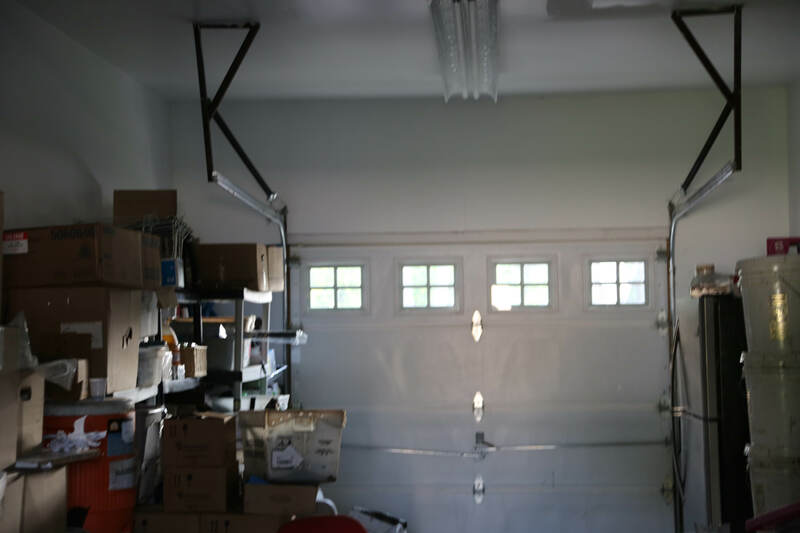 Sometime around 1940, the restaurant was turned into a garage. 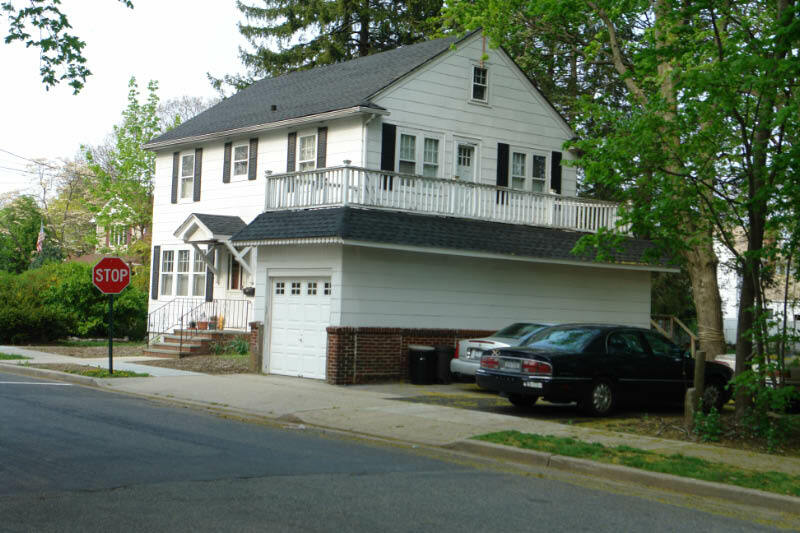 As seen in 2008, the patio above the garage, the roof overhang and the brick facade match Colleen's 1938 photos. 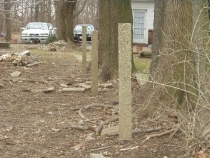 Several Motor Parkway concrete posts were seen on the perimeter of the property. The brick facade has disappeared in a recent renovation. 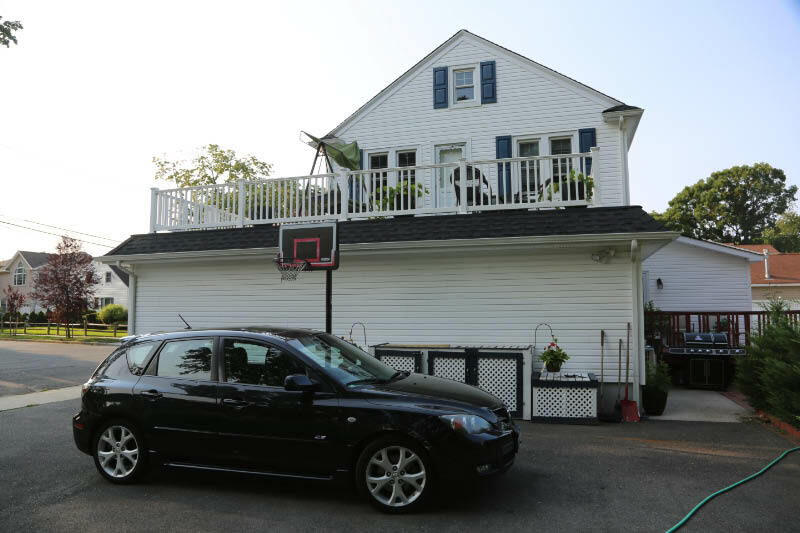 However, the distinctive patio and roof overhang remain. 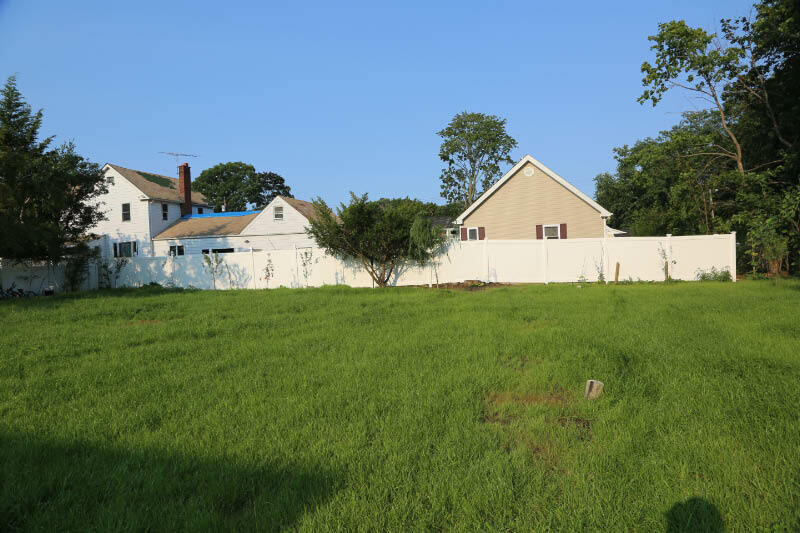 The backyard of the property is significant larger than its neighbors. 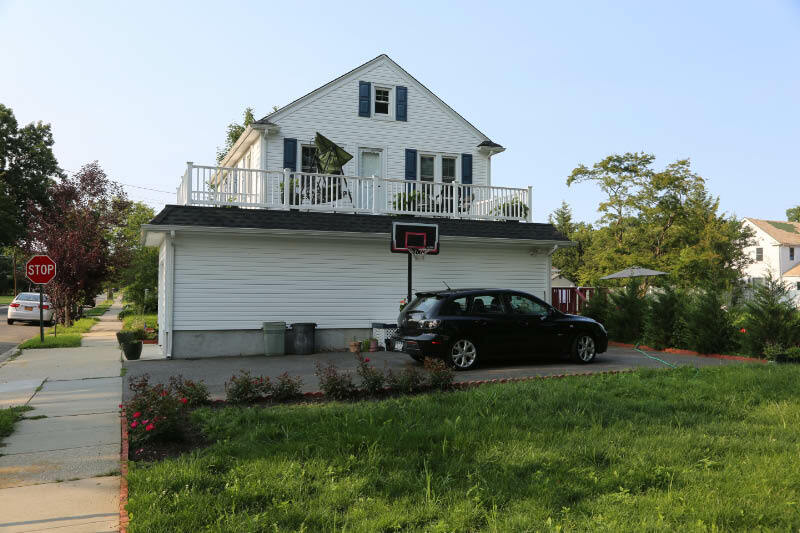 It was used as a parking lot when the Halfway House Tea Room was in business. 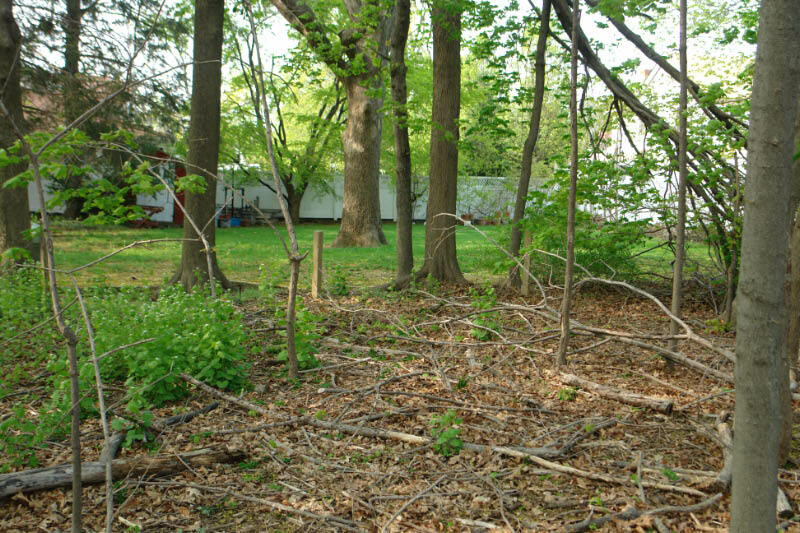 Two Motor Parkway conctere posts are still standing on the east border of the property. The Tea Room is now used for storage. No boxes of "Frankfurters De Luxe" could be found! Great photo of the Tea Room. I imagine local residents could’ve took a little walk down to have a bite here, not just parkway travelers. Wow, this is great! Nice job on the Tea Room Howard. And thank you much Colleen for those priceless photos, and to the current owner of the Halfway House! This all truly educates and help clarify the history of the Long Island Motor Parkway!